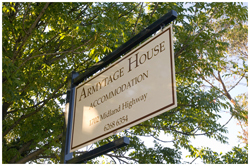 Armytage House is situated in Bagdad on the Midland Highway, otherwise known as Heritage Highway or Highway 1, the road that links Hobart, Launceston and the north-west coast. From Hobart airport the quickest route is via the country roads. Head towards Cambridge, then turn right to Richmond on the B31. Next take a left hand turn and travel on either the Back Tea Tree C323 or Middle Tea Tree Rd C322. Turn left and then right at the Pontville sign. At the T junction turn right, Bagdad is approximately 8 kms north along the Highway. Alternately you can travel into Hobart then follow the signs to Launceston. You will find us 35 kms along the Highway. Coming from the north we are the next town after Kempton. Armytage House is directly across the road from the Bagdad Community Club. Look for our sign.